Works great on propellers, shafting, trim tabs, rudders and many more! Simply spray it on, let it sit and then lightly scrub, hand polish and rinse. Effective organic salt based alternative to Hydrocholoric acid, which means not only is Barnacle Dissolver non-corrosive to skin, but it's safe for fiberglass and gel coats. Removes less metal material than power tools. 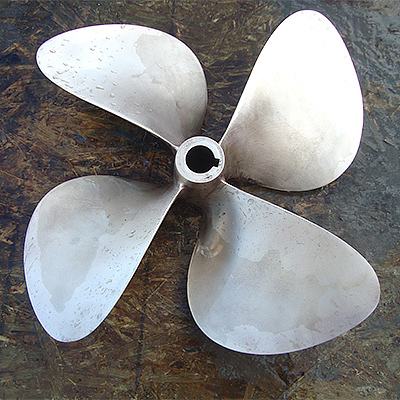 Improves performance of your propeller resulting in better boat speed and fuel consumption. 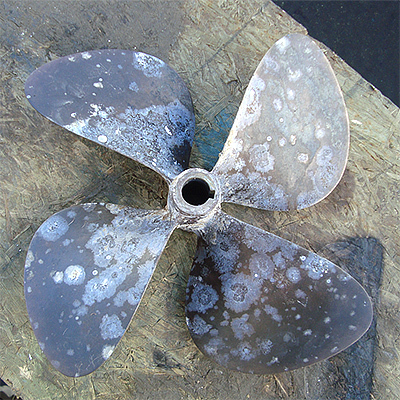 See Barnacle Dissolver as we take this propeller and make it look new again! 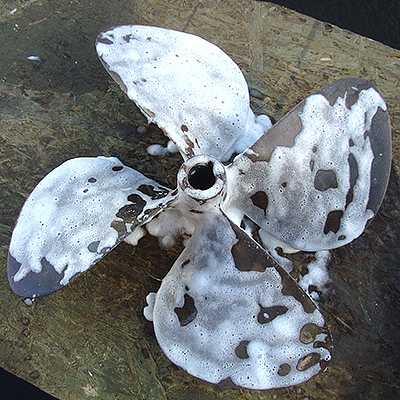 Here's a timelapse video of us cleaning a propeller from start to finish. Here are common questions we receive about the Barnacle Dissolver. If you can't find an answer to your question here please feel free to contact us. Will barnacle dissolver work in low temperature? Barnacle dissolver is an organic salt based compound that will start to crystalize in low temperatures (-32°F). If this happens, it is best to get the solution back up to room temperature and lightly shake the bottle to dissolve the salt crystals. We recommend using this product in a temperature range of between 40°F and 90°F for best results. What steps should I take to safely use Barnacle Dissolver? Barnacle Dissolver is a powerful concentrated formula and is meant to be handled like most other concentrated cleaners. During use it is important to avoid overspray as much as possible, and be aware of any effect from wind if using outdoors. We recommend using eye protection and gloves during application. Do not use on bare aluminum. How should I store Barnacle Dissolver? We recommend Barnacle Dissolver to be stored at room temperature with the cap on, and spray nozzle removed. This will keep salt crystals from forming in the spray nozzle tube. We also recommend that after each use you run warm water through the nozzle to remove any remaining Barnacle Dissolver, this will insure the spray nozzle remains clean and functional. Is Barnacle Dissolver available in bulk containers? Please call PYI Inc. if you are interested in the possibility of bulk packaging. 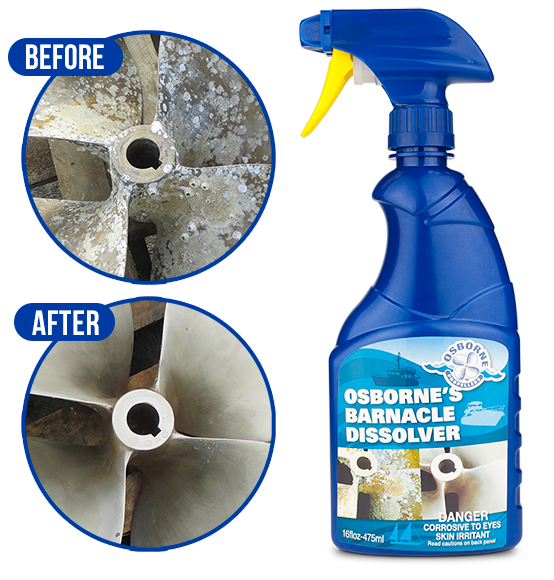 The Barnacle Dissolver is very easy to use and great for the average DIY'er. For best results please follow these simple instructions. Please contact us if you have any questions. Coat entire surface in Barnacle Dissolver. Wait 30-45 seconds. Severely fouled surfaces may require longer soak times for best results. Scrape away all marine growth. Severely fouled surfaces may require that step 3 and 4 be repeated several times to remove stubborn growth. Re-coat surface with Barnacle Dissolver. Using Scotch Brite scrub the remaining debris away, using small circular motions. Re-Coat surface in Barnacle Dissolver. Polish using a 60 grit sanding sponge. Rinse away all remaining residue. Find Barnacle Dissolver at a store near you! Need to know more information? Feel free to download our Barnacle Dissolver literature. Can't find what you're looking for? Please contact us!